International studies that confirm it is not a "gateway drug"
"David Ford brilliantly conducts us on a tour through the "Malice in Blunderland" of American marijuana policy. Based on authoritative documents, news clippings and personal stories, he presents tales of viciousness, hypocrisy and ignorance facilitated by self-service special interest groups." -- Tod Mikuriya, M.D., Head of marijuana research for the National Institute of Mental Health in the late 1960s. "When I wrote Wasted, the story of my son's drug addiction, I thought marijuana was a stepping-stone to heavier drugs. I'm now convinced that pot has nothing to do with it. 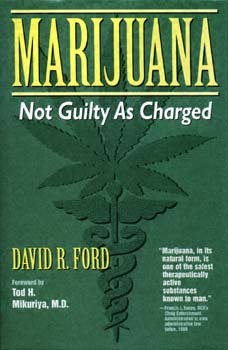 Marijuana: Not Guilty As Charged is a volauable and honest book --a "must read" for anyone who wants to know the truth. David Ford also presents ample evidence that marijuana is medicine. It's a compelling book, and it often reads like a spicy novel."